We looked at the top 1 Mandoline Slicers and dug through the reviews from 7 of the most popular review sites including New York Times Wirecutter, Foodal, Cut Sliced Diced, Expert Product Reviewer, The Healthy Kitchen Shop and more. Through this analysis, we've determined the best Mandoline Slicer you should buy. In our analysis of 55 expert reviews, the Swissmar Borner Swissmar Borner V Power Mandoline Slicer placed 8th when we looked at the top 8 products in the category. For the full ranking, see below. The box-style model of the 7-piece Swissmar Börner is great for storing the slicer and its attachments, but it has a major design flaw. It produces even slices, offers great slicing action, comes with blades for making baton (french fry) and julienne (matchstick) cuts, and has a relatively simple-to-use hand guard that keeps hands away from sharp blades. 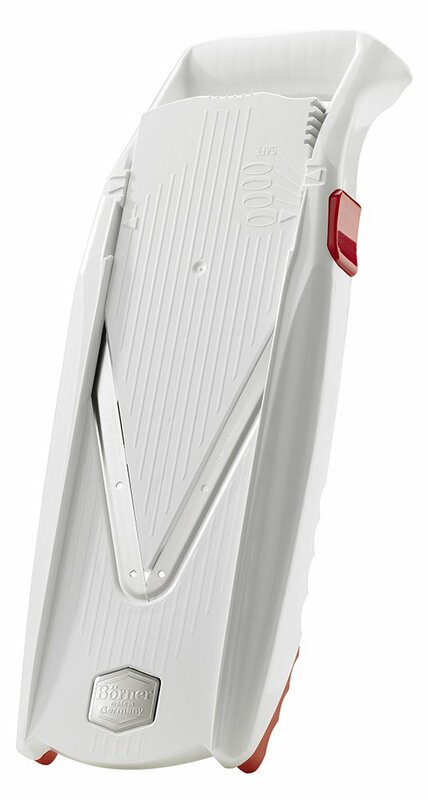 The V-Power comes with a sturdy hand guard that spikes the food, and slowly releases it using a plunger. The best feature on this mandoline is the way you can adjust the size of the slice that you’re creating. The blades being very sharp, you can use it to slice just about anything – including soft veggies like tomatoes! The V-7000 also comes with a patented thickness adjusting button so that you can easily choose different levels of thickness regardless of the type of blades you are using. Compared to other models it has an exceptionally good hand guard that fully protects your fingers. 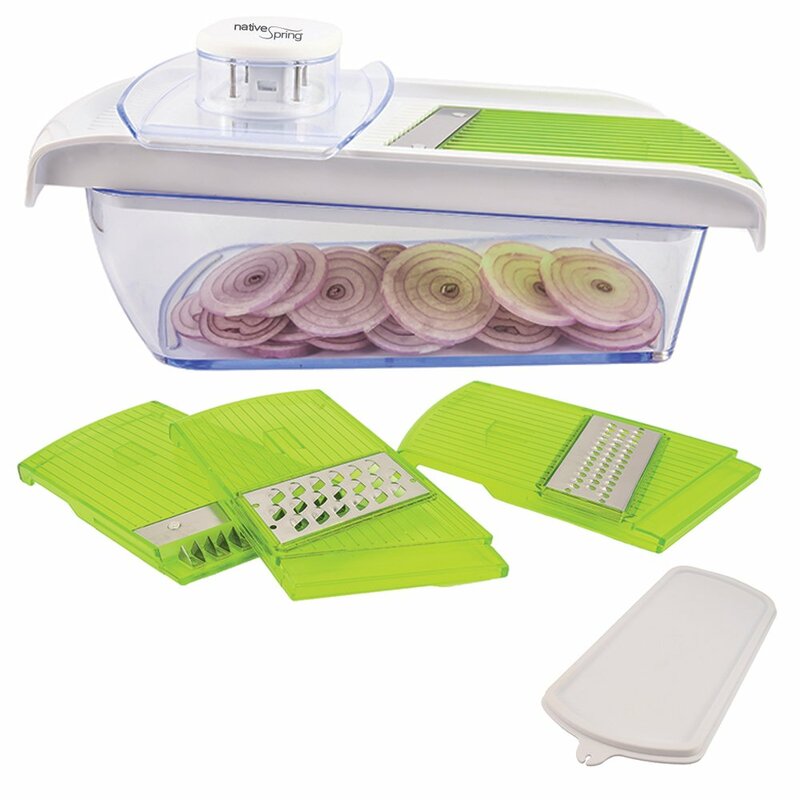 This mandoline doesn’t have a hand-held grip or retractable feet, so the storage box is also used as the mandoline’s base while you slice. The tool is pretty bulky, though, and if you have limited space you might find storage a chore. Some Amazon reviewers complain that they do not like the runway and blade design, as they feel like the insert doesn’t snap easily into place. 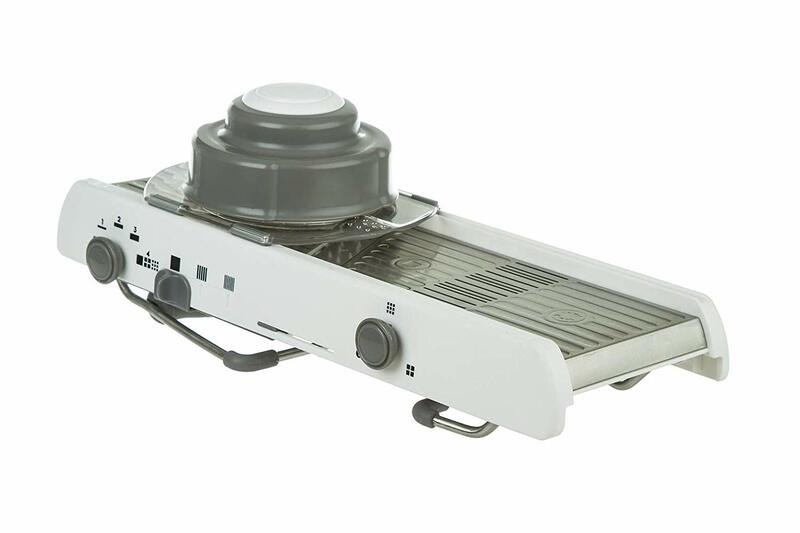 Although the price point on this mandoline is a little higher than other compact counter models that fit into a drawer, the extra quality can immediately be seen. This model does not do crinkle or waffle cuts, but the 3 inserts that are included will let you julienne, shred, cube, and cut basic French fries.